PLOT: Newlywed couple Ted and Tami-Lynn want to have a baby, but in order to qualify to be a parent, Ted will have to prove he’s a person in a court of law. There is definitely a place in the world for juvenile humour. The original Ted movie, despite feeling like two jokes stuck on repeat, showed that. 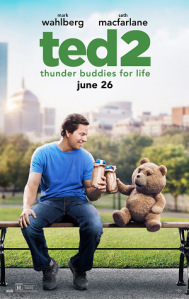 The problem with Ted 2 is that there is only one joke. The teddy bear does drugs. If that makes you laugh then you will probably survive to the end, but even then I am sure you will wish you didn’t.